This is just the test knit. It’s green. Green is all I had in worsted weight. It should be done in gold or yellow. The pattern is just being tested now. If you would like to test it join the thread in the Testing Pool on Ravelry. 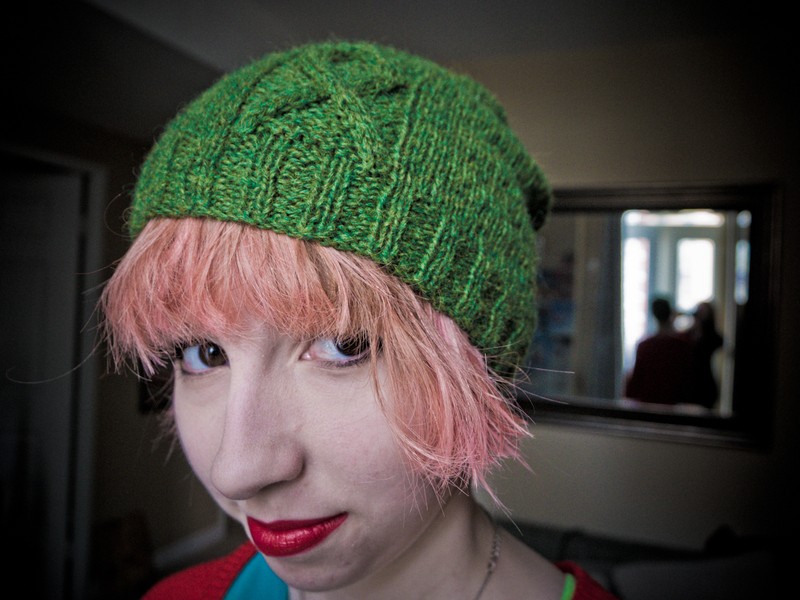 This is a slouchy hat, knit on 5mm circs with only one ribbon cable. The instructions are written so a fairly new knitter can understand and learn a few new skills like knitting in the round and cabling. This hat will be used for the Gold Ribbon Craft promo to promote the ebook but also to raise awareness for childhood cancer this September. Hats will be sent to celebrities who will be asked to tweet a picture of themselves in the hat with the hashtags #childhoodcancerhat and #goldribboncraft. If you would be interested in helping out join us on ravelry here. This entry was posted in awareness, pattern, project and tagged cancer, childhood cancer, childhood cancer awareness, design, gold craft, knitting, pattern, pediatric cancer, project by GoldenCancerMom. Bookmark the permalink. Wonderful addition to the other hats for this project! Thanks! I’m so pleased with how it came out.